Rapportive is a tool which adds rich profiles for your contacts in Gmail, linking them to profiles on Twitter, LinkedIn, Facebook and more. In one sentence, what is Rapportive? 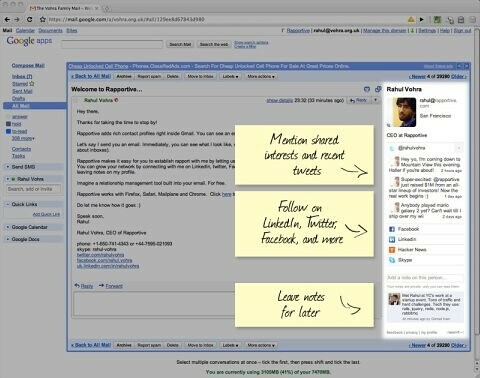 Rapportive is a free tool which adds rich contact profiles to Gmail. What problem does Rapportive solve? Rapportive helps you establish rapport, grow your network, understand your contacts, remember their preferences, and record call and meeting summaries. We started to build Rapportive in January 2010, and we launched a few months later in March 2010. As it happens, our launch was somewhat accidental, see here for the full story. Back then, our main motivation was to solve problems we experienced at previous companies. For example, consider the problem of maintaining excellent rapport with VIPs. A great way to maintain rapport with somebody is to follow what they say around the web, at places like Twitter, Facebook, LinkedIn, and their blog. However, the number of channels on the web are only increasing, and we’re all already suffering from information overload. For any more than a trivial number of contacts, this rapidly becomes too time consuming. To solve this problem, we decided to bring recent tweets, status updates, blog links, and social network links inside email. For another example, consider the problem of investigating leads. You’ve just done five days at a trade show, and your inbox is filled with hundreds of follow-up emails. Which leads are large corporations with histories of buying products similar to yours? Which leads are small companies with no obvious sources of revenue? How do you decide where to spend your time, and who to make concessions for? You remember the face of a delegate who got very excited, but which of the hundreds of emails is his? To solve these problems, we decided to bring peoples photos, companies, and job titles inside email. Our target audience is anybody who uses Gmail or Google Apps. As you’d expect, we get a lot of love from folks in sales, business development, and customer support. Having said that, we are continually surprised and excited by the increasing variety of use cases that our users find. For example, I recently heard from several landlords who love Rapportive and use it every day, and they find that filtering prospective tenants on the basis of their Rapportive profiles is actually far more efficient than a 10-minute viewing. Our immediate goal is to show more information for more contacts. As part of this, we’ve integrated with Econsultancy: as of today, all your members will automatically have links to their Econsultancy profiles on their Rapportive profiles! What were the biggest challenges involved in building Rapportive? Every start-up experiences a challenging period when they transition from pure development to having a launched product. Suddenly, customer support occupies a lot of time. Investment offers arrive and distract you. Infrastructure creaks under continued growth. Press and bloggers conspire to demand your time. You think need to recruit, but you aren’t sure how to do it. Who’s remembering to actually build the product? My co-founder, Martin Kleppman, describes these challenges of having a launched product over at his blog. There are currently five of us: myself, Martin Kleppmann, Sam Stokes, Conrad Irwin, and Lee Mallabone. We’re all computer scientists, and we tend to geek out a lot. We plan to release premium features for which we will charge, but there will always be a free version. The details are still to be worked out, but it will most likely be a monthly subscription. Facebook’s Sponsored Stories: new ad format, same old legal problems? behind other prominent internet companies like Google.